When submitting forms, there is always the possibility that an email or phone number field could be filled in incorrectly. This results in stuck submissions, which appear on the Dashboard as a "Form Delivery Issue". In order to fix this, the answers can be edited via the Dashboard. First, click on where it says "Form Delivery Issue". This will take you to the "Delivery Problems" page, where you will see the stuck submission listed, along with the reason for the error. Next, click "Edit Submission Values". The "Edit Pending Submission Payload" page will load, and it is here that you will be able to edit the incorrect entry. Once you have corrected the fault in the email address or phone number, click "Update Pending Submission". You will then be taken back to the "Delivery Problems" page, where you will see a banner notification that says "Submission payload successfully updated. Please retry the submission if you would like it to try again immediately." 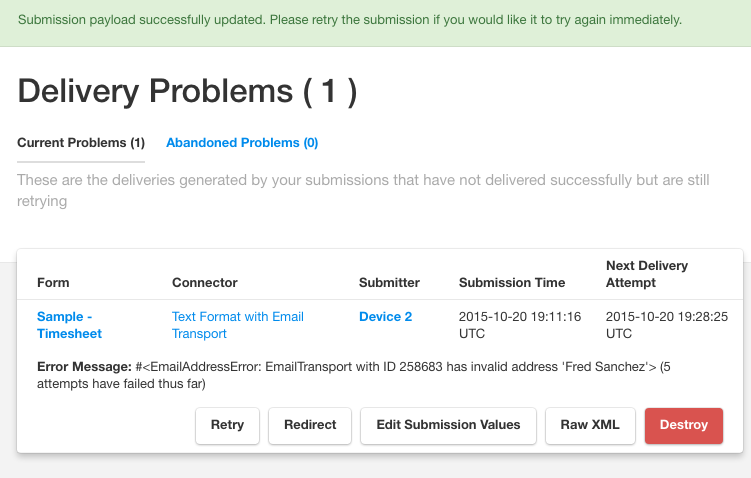 This means that if you press "Retry" at this point, the stuck submission will try to resubmit the form. Alternatively, you can re-edit the email address or phone number entry, by clicking "Edit Submission Values" again. 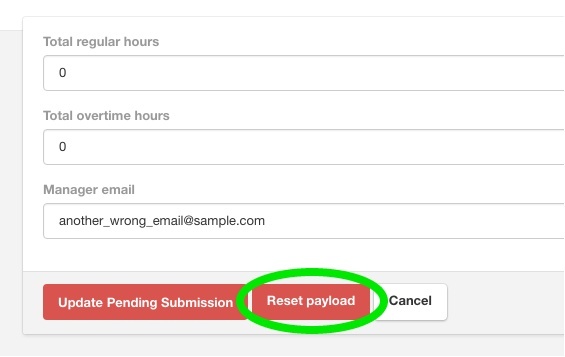 Additionally, if the wrong field was edited or you would like to revert the email or phone number entry back to what it was initially, you can click where it says "Reset payload" on the "Edit Pending Submission Payload" page. Once this has been done, you can resubmit the form.